How much can I “can’t even” with fall? That is the question. It’s pretty ridiculous and basic and I want all the boots and leaves and apple picking and cinnamon candles in my life. This is how I’m dealing. By making you drinks! Today I’m sharing another video that I made with my local favorites, DeLallo, a few weeks ago and all week I’ll be telling you about some killer fall eats. I can’t even wait to tell you about tomorrow’s recipe because I’ve had it on lockdown for two months – it’s really not THAT exciting, it’s quite simple actually – but it is my favorite recipe that I’ve made this autumn. It is sooo comforting and soul warming and, better yet… EASY. And yes… squash. Embrace it. I’ve even made it three times since August which is saying a lot since I’ve been home for all of 13.4 minutes. GAHH I can hardly wait. But for now… cider cocktails with jam. You can take a peek at the video below and see my baby bump covered in flour and imagine how difficult it was to make ten jam cocktails with one of my treasured seasonal items – apple cider – and not throw them down the hatch continuously. I jumped on the jam trend waaaay late but am totally loving the fun addition that it makes for drinks. And FYI, you totally CAN leave out the bourbon if you’re knocked up like me or don’t consume alcohol. I like to increase the ginger beer and maybe even add a drop of club soda – it’s kind of like a jam-my apple cider punch? Then add a bunch of fruit slices and maybe some pretty star anise and go to town. For my first seasonal jam cocktail, I used the DeLallo citrus marmalade because, um, it’s made with freaking clementines! Dead. Hello, lover. 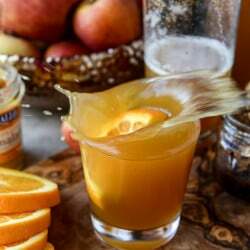 I love apple cider with a hint of orange and citrus, and tend to love bourbon with the same, so I knew it would work. 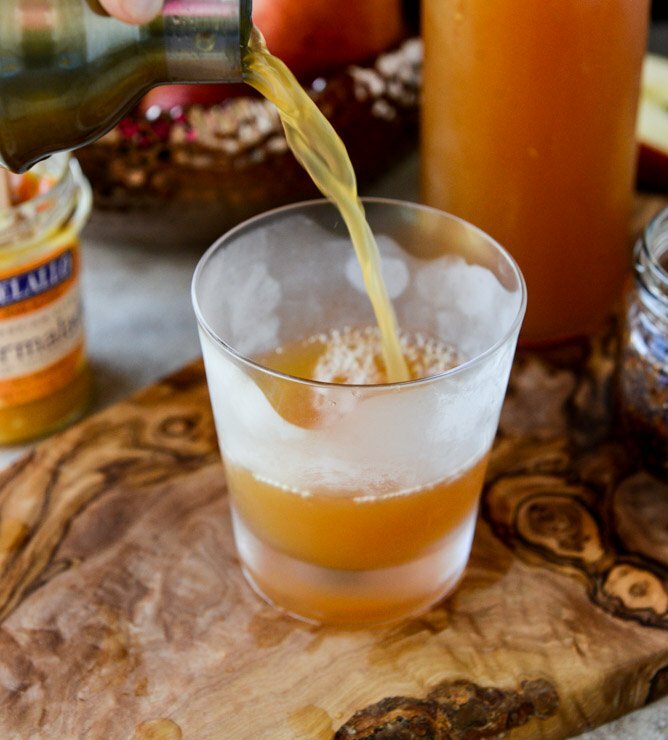 The tricky part in using a marmalade can be the rind slices – so you may want to make sure you get a hefty spoonful of mostly jam without thick rind – that way it can combine with the liquid in the shaker and be poured into the glass. Since I like to torture myself, I also made these cocktails for friends, first with some apple butter (which was awesome, though depending on the consistency you may need slightly less than a teaspoon) and then with… fig jam. Oh mylanta. Fig jam is probably my favorite jam, and even though I could only sneak a tiny sip, I can probably say that would be my go-to. Triple berry jam works too. Oh does it. My grandpa is all “oh aren’t you drinking a glass of wine everyday? You can do that while you’re pregnant,” and looks at me like I’m crazy when I say “well… no?” Ohhhhh the mad men days. 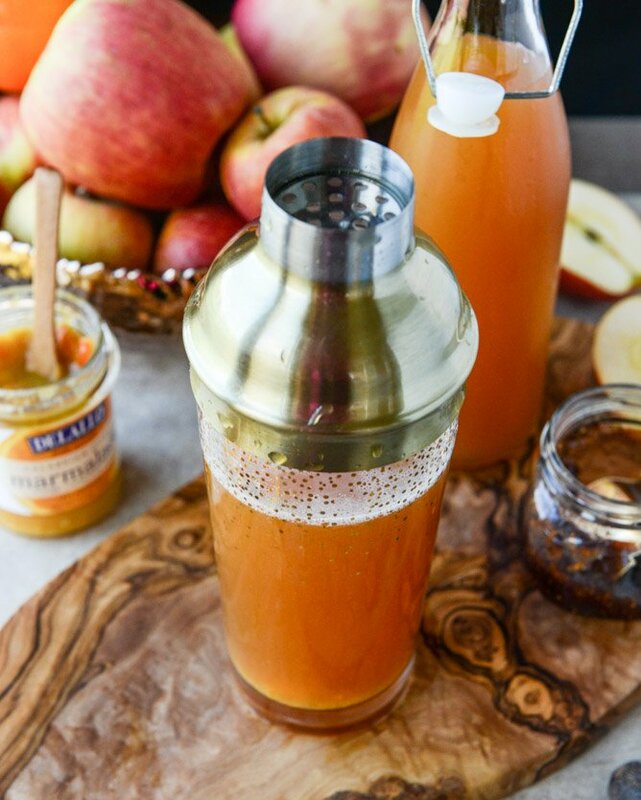 Add the apple cider, bourbon and jam to a cocktail shaker or mason jar with a few ice cubes. Shake until mixed, about 30 seconds, then pour the drink into a frosty glass. I prefer to use frosty glasses over actual ice because I find that the jam sticks to the ice. Top off the cocktail with the ginger beer, a few fresh grates of nutmeg if you’d like, and an orange or apple slice. Serve with a spoon (with more jam if desired) – the secret to these cocktails is to stir occasionally so the jam doesn’t settle so much. Enjoy! I can’t even either. Maybe we can odd? Also that first photo got my inner neat freak for a second…but it looks wonderful anyway. I love, love, love all of your DeLallo videos! And these jam cocktails look amazing, per usual. 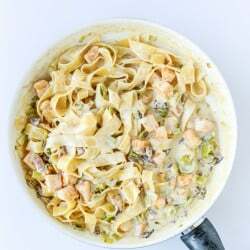 that pasta with bacon, leeks, and squash looks KILLER! and bulleit bourbon? the.best. These cocktails look amazing! I love your videos! OMG that first photo–I love it so much! What a great capture of a triumphant splash. How cool is that first pic?! Awesome shot! Speaking of ‘I can’t even’. I can’t even with you in these videos. You’re just so freaking gorgeous, and DAMN that squash pasta has me licking the screen (figuratively….or is it?). Serious major deliciousness. This looks and sounds amazing! Jam in cocktails…I’m in! Thanks for taking the time to do the video, too! And that opening splashy shot….love. Pinned! Omg loved the video..these cocktails look amazing!!! I’m making them ASAP! I want to make everything in that video! Can’t wait for your fall recipes this week!! I want to print out that first photo!! SO cool looking!!! And this cocktail sounds awesome! YUM! Cannot wait to try this out at a fall craft night coming soon! So super great. I want everything you just made in that video. In France, doctors recommend women drink a glass of red wine every day (not joking)! Damn this looks amazing! LOOOOVE! That first picture is awesome. And this cocktail looks divine! 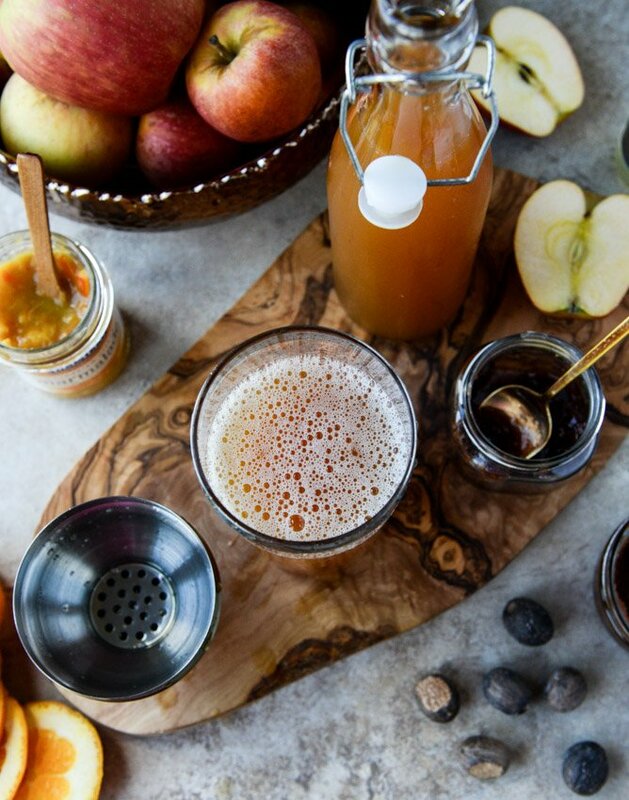 Adore orange marmalade and apple cider…genius combination. Can’t wait to make it! I love all the fall things and have just swapped out my summer sandals for boots. Happy/sad face! 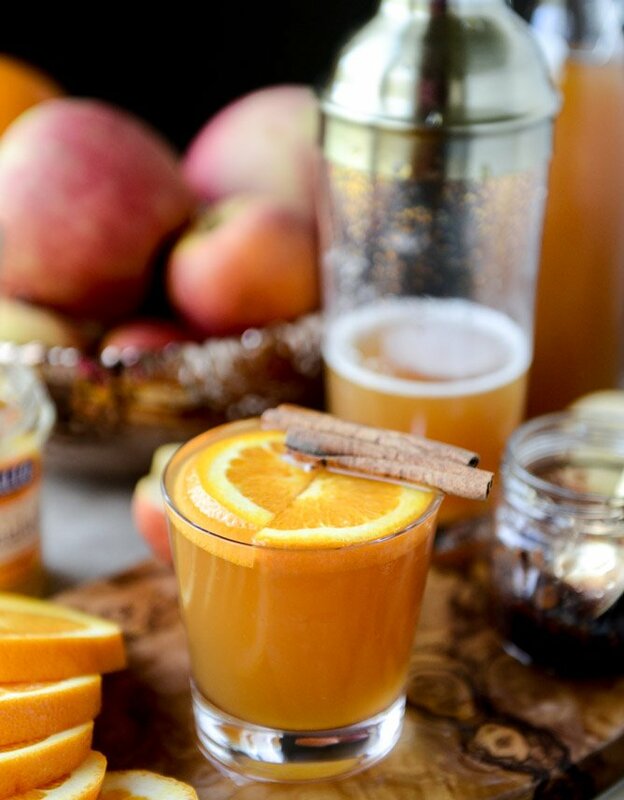 This cocktail looks perfect for cool fall nights! Can not WAIT to try this?! Also, where did you get that shaker?! So cute, I need it!!! I have some vanilla bourbon jam that is begging to be used in this. Yesss fig jam is awesome! And I just discovered that my beer hating self likes ginger beer last week, when my friend made me a Moscow Mule with it, which I thought I wouldn’t like but lovedddd. How fun! I play around with a lot of smashes — fruit, botanical, booze, fizzy … I also make homemade jams (blueberry thyme, rhubarb ginger, blackberry anise) … why didn’t **I** think of this? Thanks for the inspiration — we’ve got all winter, right? I’m always on the look out for a new adult beverage. This sounds fantastic! These look INCREDIBLE!! With extra exclamation points! I see a Halloween party with these in my future! I didn’t even know that jam in cocktails was a thing. I have a jar of orange fig jam in my fridge that would probably be perfect. If it’s good on a grilled cheese with smoked gouda, I’m sure it’s good in a glass. Definitely trying this!